Being born and brought up in Gujarat, it was a totally new experience for me to move to Bundelkhand (Central India). Its tradition, culture, food and music are quite different from that of Gujarat, where I had spent eight years working for All India Radio, as well as producing community radio programmes for tribal community in south Gujarat for two years. I had never visited Bundelkhand, till I joined Radio Bundelkhand- the first Community Radio of Madhya Pradesh. Radio Bundelkhand was established by Development Alternatives at TARAgram, Orchha in Madhya Pradesh on 23rd, July 2008. Since then, it has been airing shows for its audiences which includes women, youth, farmers and vulnerable groups and it reaches out to more than 120 villages within a radius of 15 kms. Radio Bundelkhand is jointly managed by DA and the community, where the programmes are produced with the participation of people. 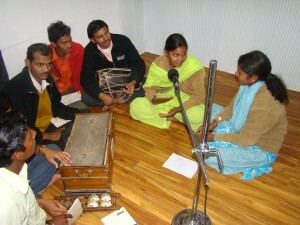 This unique participatory model of programming and broadcast works along with people; to create awareness, give information, participate in local self governance and also provides entertainment. All the programmes are designed on the basis of feedback from communities. Bundelkhand is primarily a patriarchal society, where men are the decision makers and women are expected to stay at home, do household work and look after family. Things are stricter, as we move towards rural Bundelkhand; where women work with long ghunghat (veil) even within the home. Some women do work on the field to help their husbands, but they too are required to take ghunghats (veil). Despite all these factors, an important point which is quite evident is that women from Bundelkhand like women from any part of India; want to learn to read, write, participate actively in financial activities and voice their opinions. Development Alternatives with its Community Radio- Radio Bundelkhand has empowered many women and has helped them to go beyond their limits. In fact, women are the backbone of Radio Bundelkhand, as they confidently carry out different roles; be that of a reporter, presenter or a resource person. Women actively participate in the programming; right from coming up with ideas for radio programmes, to sharing their talent and to presenting the radio shows. 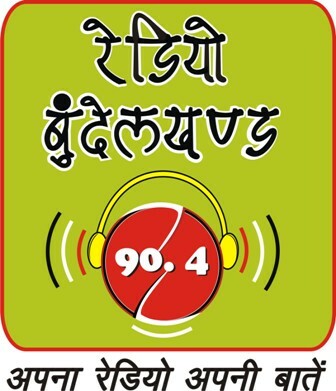 Currently Radio Bundelkhand broadcasts transmission for 11-hours, daily between 07:00 am – 1:00 pm and 5:00 pm – 10:00 pm. These broadcast timings for programmes have been decided by the communities based on their daily routine; women prefer the morning sessions, while men prefer the evening slots. 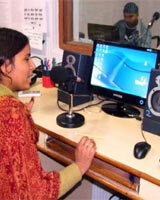 Radio Bundelkhand has different programmes related to every subject. For example, ‘Sakhi Saheli’ is a special programme for women, which provides them a space to share their experiences. This way, it fosters a dialogue amongst people, who are listening to the radio programmes even on issues which have never been a part of their routine discussions. In this way Radio Bundelkhand plays an important role of initiating discussions in the community, which leads to acceptance and rejection of ideas, initiating a step towards change. Community Radio reporters have started to see women as a farmer. ‘Khetkhaliyan’ is an agriculture based programme, where women share their experience as farmers. They talk about the crop patterns, as well as the technique they use in the farming. Women are not only a part of the field, but they play a very crucial role while deciding about the market and price. 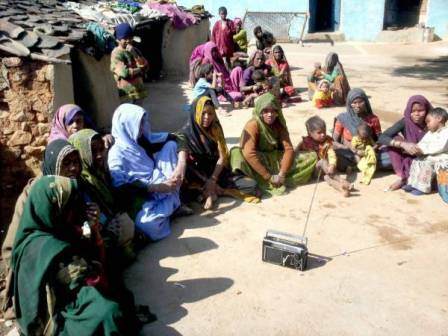 Moreover, women also sing folk songs for the Radio Bundelkhand. Today there are more than 2000 Bundeli songs recorded by Radio Bundelkhand, which is one of the largest collections of Bundeli songs available. During live programmes, women come and share their success stories. Radio Bundelkhand has connected women from different fields of work. Meenadevi from Bagan, a neo-lieterate who just completed TARAakshar+ programme came for a live discussion, where she shared her experience with the community radio presenter. She shared, “initially I struggled a lot to convince my family for my education, but ultimately I was able to win their support. After attending TARA Akshar+ programme, I can read and write and even do simple calculations.” Radio Bundelkhand also broadcasts programmes, where women from police department provide information related to women and law. There is another show, where women from academic departments, come to speak about women and education.